Veterans,Dreamers, Immigrants, and Latin/x communities (some of them veterans themselves) share unique and resonant experiences with migration as a result of forces such as class aspiration, struggles for citizenship, various forms of violence, and stresses from complex trauma. This workshop brings these communities together to share and learn from their expertise as poets, artists, workers, and common people shaped by varied experiences of migration. Inspired by the Poetry Coalition and Canto Mundo’s shared programming, "Because We Come from Everything: Poetry and Migration,” CantoMundo, Frontline Arts, Mobile Print Power and La Morada continue to conduct this process-based project, where each workshop-session informs the next over a course of two years, and results in a traveling visual art exhibition to showcase shared struggles and experiences across borders. 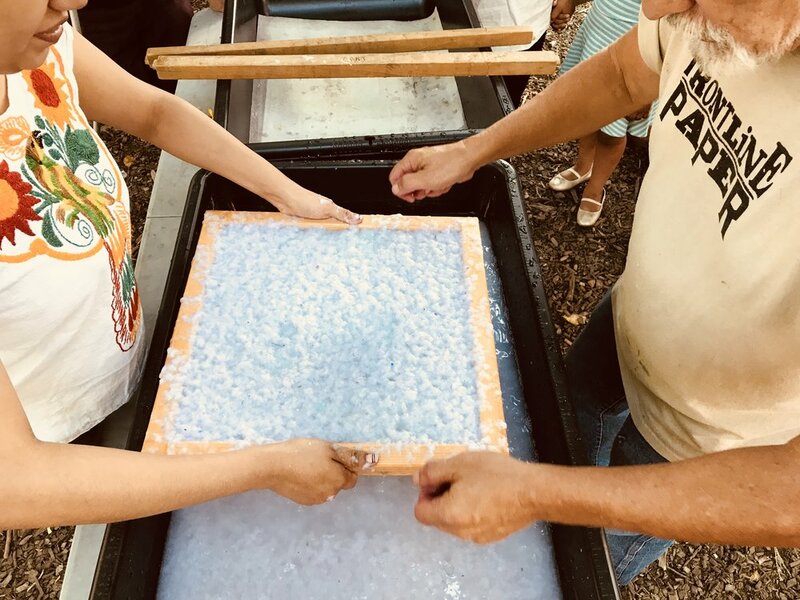 The project started with the first-phase in August of 2018, in partnership with the Bronx Museum, which consisted of four workshops in the South Bronx where immigrants and veterans made paper and prints from cultural objects and plants native to the Bronx and Mexico, military uniforms from local veterans, and clothes from Mexican street vendors. The dialogue and art created from these sessions informed the next phase - coming in December 2018 - which will consist of three poetry workshops in Morningside Heights at Columbia University. These workshops will be facilitated by a Canto Mundo poet, with both veteran students and immigrants, participants from the previous phase, and new local participants, creating poetry by reflecting on the paper, prints and dialogue from the previous phase. The art and poetry created from the first two phases will be brought together in a third phase of the project in March 2019. 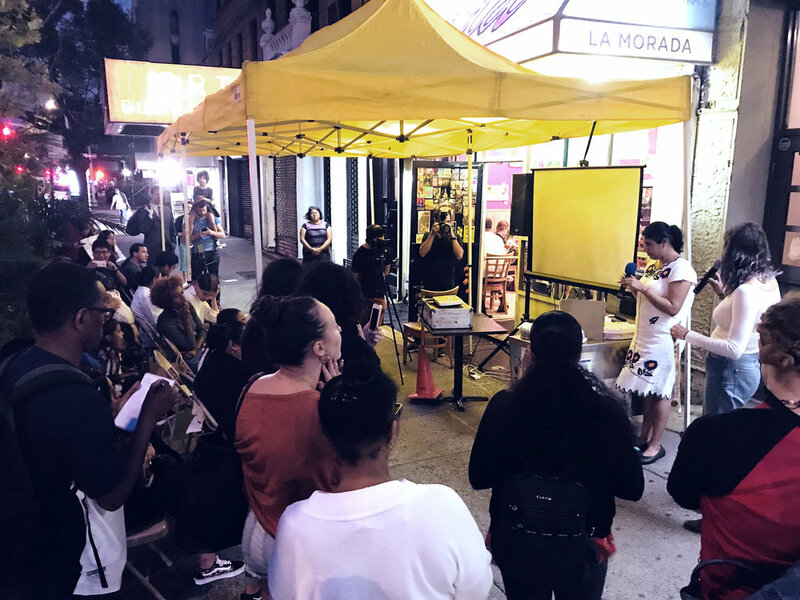 This third phase workshop will be a public, participatory artmaking session that is planned to be held over the course of three days in East Harlem, potentially in the Art Space at El Barrio PS 109. This phase will draw new participants from Harlem and surrounding areas to print additional words and poetry on select paper from the first phase. The final works created will be a series of broadsides reflecting a communal, common narrative across connected communities from the South Bronx, Morningside Heights, East Harlem, and New Jersey. In a fourth phase, the finished works of art will then be sent across borders to family members and friends of the artists who have been deported, cited as not allowed to enter the United States, blocked by the ban, rejected for citizenship, or otherwise unable to travel to the United States, etc. These family members and friends will be instructed to add to the print, and provided postage for sending what they've created back to the original artists. Once the work is returned, the fifth phase will be a traveling exhibition in Fall 2020. Frontline Arts will ensure to create multiple prints of the work to archive, to include in portfolios, to showcase in the traveling exhibition (both physically and digitally), and to distribute to the artists and their family members who co-created the final products. The initial exhibition and poetry reading will take place in NYC, with a possible weekend symposium focusing on the connective practice of transformative art and public participation can find commonality between communities. This bringing together of people highlights social difference, prompting the importance of celebrating and protecting cultures of identities, yet also creating a new culture of commonality - a new creative common language of shared experiences, Our ability to live and produce within this environment is achievable, and we must promote this type of participation. Building walls and creating bans only stifles that connection. 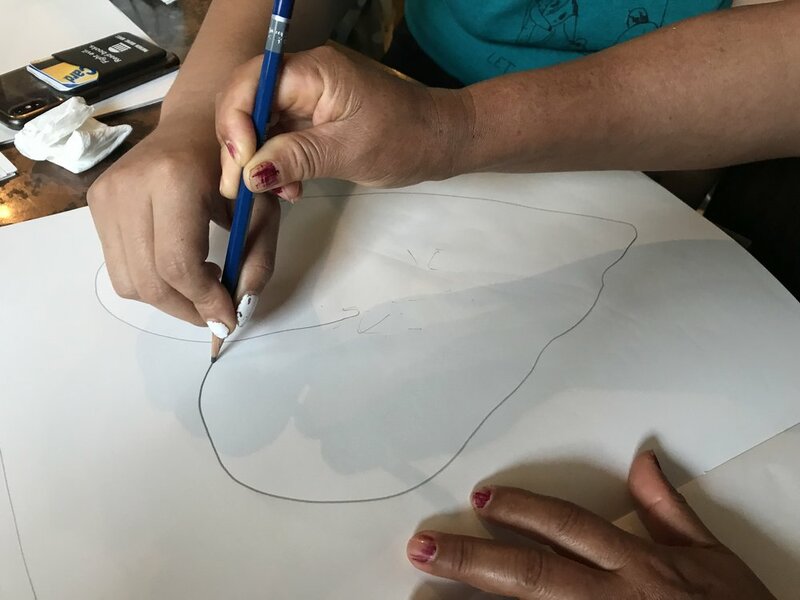 “After our first phase of veterans and immigrants sharing stories and making paper and prints together from trace-objects, which included three workshops in the South Bronx and one workshop at Frontline Arts Studio in New Jersey throughout August and September of 2018, we are discovering common themes of loss, violence, betrayal and trauma between the two communities. Both are very different, yet with threads of commonality connecting the two. Among these threads, the topics of PTSD and CPTSD (Complex Post-Traumatic Disorder), similar yet very different forms of disability, freely surface in our conversations. One (PTSD) refers to the re-living of a finite traumatic event or cluster of events, the other (CPTSD) is the continuity of infinite traumatic events starting in the formative years and unremittingly building upon one another. Both are devastating chaos narratives of dehumanization, unrelentingly skewing one’s moral character and stripping away a sense of belonging, revealing an individual desperately trying to reconstruct simultaneous memories of trauma, to both make and re-make sense. Additionally, the currently applied term ‘migration’ is starting reveal itself, not as a term for the act of crossing borders, yet the act of those being uprooted, forced, pushed, subjugated…or else suffer the consequences. What was once a natural and holistic way of life for nomadic peoples is now a divisive term of the marginalized. And so we create a new language of migration, as words migrate across paper, stories migrate between people, trauma migrates through generations, paper migrates from community to community, art migrates across frontlines and borderlines. After two years of planning, the project began Saturday, August 11, 2018. Frontline Paper, Mobile Print Power and Bronx Museum conducted narrative, visual and reflective sharing sessions with the participants. 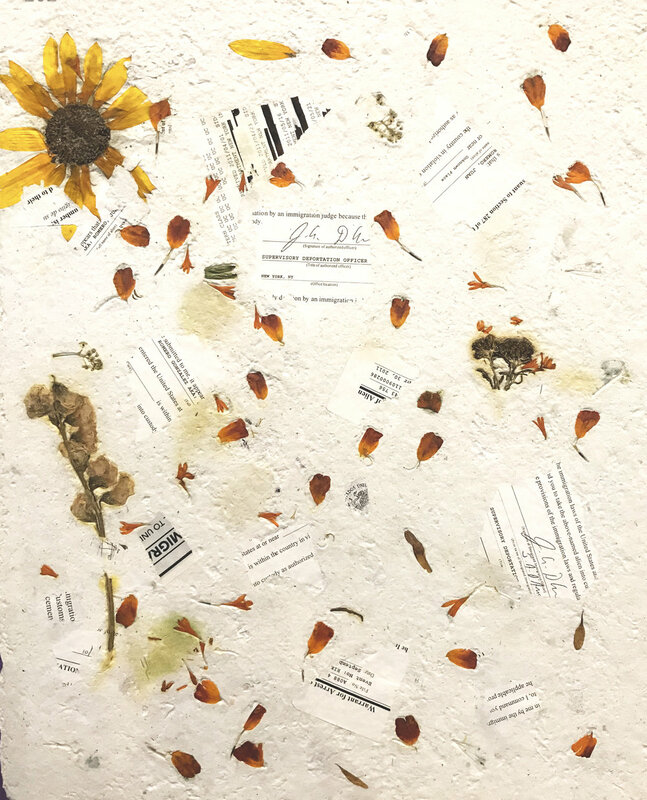 The sessions utilized communal journals for writing and drawing, prompted by a question and discussion around commonalities of ‘migration.” The images and text that were developed were printed on handmade paper from cultural objects, clothes, military uniforms and trace objects. Each participant made multiple personal works, resulting in roughly 50 works of art made. The community presentation that included an exhibition of the art made, and spoken-word presentations by individual participants, was a passionate response on themes of violence toward immigrants, police harassment, and gentrification. There was an overwhelming feeling of solidarity between the veteran and immigrant communities involved, and some participants expressed that this was the first time they felt safe telling stories of their experiences and expressing their feelings of what it means to either be an immigrant or a veteran in this country. CantoMundo poet will conduct poetry workshops for participants to reflect on the art and dialogue created from the first phase. 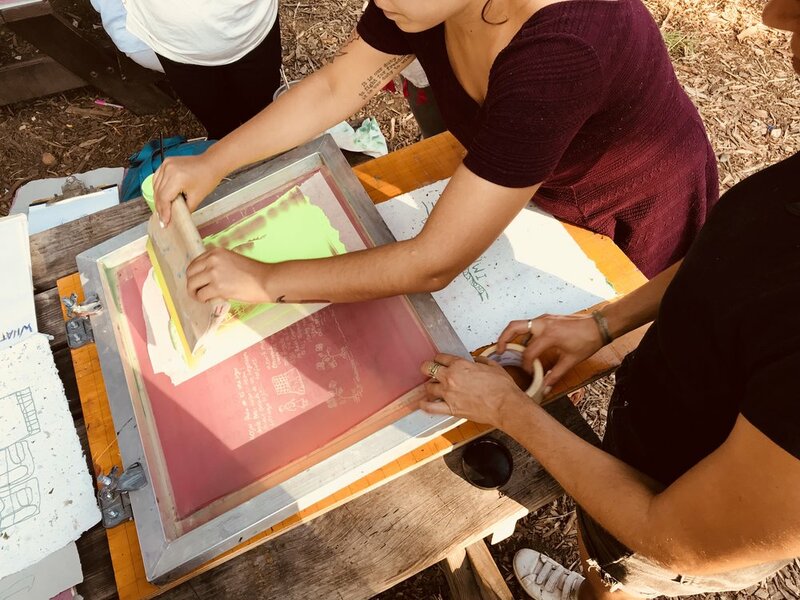 The poetry and paper made from previous phases will be brought together via letterpress and/or silkscreen in a participatory art workshop for local veterans and immigrants in and around East Harlem. The final work will be shipped across the border to Mexico, and additional countries based on participants. The cross-border recipients are asked to interact with the broadside in any way they choose (write on it, make it into a collage, etc. ), and return it (self-addressed, postage-paid envelopes included) to the senders. Work is finalized and sent as a traveling exhibition, with a possible symposium.